Asbestos is a group of minerals which naturally occuras a bundle of fibers in the environment. It is resistant to heat, electricity, fire and chemicals, and is therefore used widely in many industries. It is extensively used in the building and construction industry for strengthening cement and plastic, and for insulation, roofing, fire proofing and sound proofing. Shipbuilding industry, automotive industry, and gardening industry also benefit from the usage of asbestos. Such heavy usage of this mineral comes at a cost. Asbestos is made of tiny fibers which are released in the air when asbestos-based products are disturbed. These tiny fibers may get trapped in the lungs and remain there for a long time. When the fibers accumulate, they irritate, scar and cause inflammation which makes breathing difficult, leading to serious health problems. Asbestos has been classified as a human carcinogen by the US Department of Health and Human Services, and the International Agency for Research in Cancer. Helsinki criteria are a set of criteria to help doctors decide whether a particular instance of lung cancer is asbestos related. The first criterion is time bound – the cancer should have developed after 10 years of initial exposure to asbestos.The second deals with the amount of asbestos in the lung tissue. If it is more than 25 fibers per milliliter of air, then it qualifies for asbestos related lung cancer. How does a person get lung cancer from asbestos? We are exposed to tiny amount of asbestos at some time in our life, because it is everywhere – air, water, and soil. It causes harm only when a person is exposed to it over a long period of time, in a job where they work directly with it, or in an environment where the material is abundant. Usually, people who develop asbestos related diseases do not show any signs of illness for a long timeafter their first exposure. It may take between 10 to 40 years for symptoms to surface. Mesothelioma is a milder form of asbestos related cancer, which can develop in family membersof people who are exposed to asbestos regularly, because the fibers are brought home through the shoes, skin, and clothing of the exposed people. 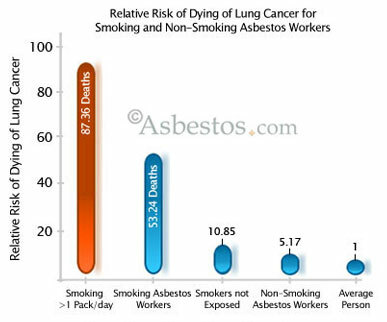 In addition to long exposure to asbestos fibers, smoking and preexisting lung disease increases the risk of asbestos related lung cancer incidence. There are two types of lung cancer caused by asbestos. Small cell lung cancer: It originates in the bronchi, and is an aggressive cancer which spreads throughout the body very quickly. In some cases, before it displays any symptoms, it would have spread to other parts of the body such as lymph nodes, bones, liver, adrenal glands and brain.It is small in size but creates large tumors. Non-small cell lung cancer: There are 3 sub types, squamous cell carcinoma, adenocarcinoma, and large cell carcinoma.These are less aggressive and have more treatment options. Breathing difficulty, with persistent cough. Pain and tightening of chest. Fatigue, anemia, and weight loss. If a person who has been exposed to asbestos develops one or more of the above symptoms, he should talk to the family doctor immediately.The doctor will usually prescribe a chest x ray. The chest x ray will not detect asbestos fibers in the lungs, but will show signs of lung disease, if any. If the x ray shows something abnormal, a series of pictures taken by a computerized machineattached to the x ray machine will detect any asbestos related lung abnormalities. A very reliable examination is a lung biopsy to ascertain the presence ofasbestos fibers in the lung. The treatment for lung cancer includes surgery, chemotherapy, and radiation therapy, along with targeted therapy.Targeted therapy uses medicines or other substances to find and attack specific lung cancer cells without harming normal cells.The primary aim of the treatment is to kill cancer cells and prevent spreading the cancer to other parts of the body.In many cases, the cancer may have spread already. Many asbestos related lung cancers have no cure. In such cases, the treatment is aimed at alleviating the symptoms and improving the quality of life of the person. If the cancer is diagnosed in an earlier stage, it will be relatively easier to treat.The treatment will differ considerably depending on the type of lung cancer. If the cancer type is small cell, and if it has spread to lymph nodes and other organs, the treatment will be difficult and complex. Surgery is performed to remove the tumor and nearby tissues depending on the size of the tumor. If the patient has any preexisting diseases, then surgery is not a viable option. If the disease is in early stages, there is a high chance for successful treatment. Chemotherapy is used when the cancer has spread to lymph nodes. Chemo helps in reducing the tumor size. When surgery is not an option, radiation therapy is considered. Often, radiation is used along with chemotherapy, in order to make it more effective. Jobs where people are in closed spaces where asbestos fibers are present are high risk. Construction workers, auto mechanics, plumbers, textile workers, roofers, sheet metal workers, insulation installers, tillers, and roofers, are all at risk. The high risk group to develop lung cancer from asbestos exposure includes war veterans since they are exposed to asbestos due to their placements in ships, submarines, tanks, planes and barracks which are built with parts and products of asbestos. Another group of people who are at high risk to develop lung cancer would be smokers who are exposed to asbestos products for a long duration. The asbestos exposure combined with tobacco crates high probability to develop lung cancer. Avoid working with asbestos as far as possible. Check if the person you are working for is a licensed contractor. Get the necessary training before working with asbestos. Minimize asbestos dust by using hand tools, and keepingequipment damp. Cleanup as you go, by using vacuum cleaner without the brush. Wear a proper mask at all times. Get regular health checkups if you are exposed to asbestos during work. Pay attention even to small signs and symptoms. If you have been diagnosed with lung cancer, don’t lose heart. The treatment depends on the type of cancer that you have, and several clinical trials are underway to treat specific types. You may even qualify for cutting-edge treatments offered by clinical trials because of the specific type of cancer that you have. 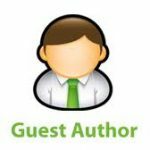 This is a guest post by Sameer Gupta, a medical writer at empowereddoctor.com. Read More here. If you are also interested to write for HealthResource4u, Please check our guest posting guidelines at write for us.